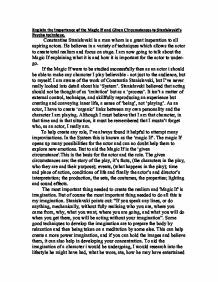 Explain the importance of the Magic If and Given Circumstances to Stanislavski's Psycho technique. Constantine Stanislavski is a man whom is a great insperation to all aspiring actors. He believes in a variety of techniques which allows the actor to create total realism and focus on stage. I am now going to talk about the Magic If explaining what it is and how it is important for the actor to under-go. If the Magic If were to be studied successfully then as an actor i should be able to make any character I play believable - not just to the audience, but to myself. I am aware of the work of Constantin Stanislavski, but I've never really looked into detail about his 'System'. Stanislavski believed that acting should not be thought of as 'imitation' but as a 'process'. It isn't a matter of external control, technique, and skillfully reproducing an experience but creating and conveying inner life, a sense of 'being', not 'playing'. As an actor, I have to create 'organic' links between my own personality and the character I am playing. Although I must believe that I am that character, in that time and in that situation, it must be remembered that I mustn't forget who, as an actor, I really am. ...read more. To begin with, I would create a very small circle around me, focusing on myself and character, what I'm wearing and what I'm doing. Then I would spread the circle farther away, drawing in nearby objects and props or any characters stood by. Finally I would spread the circle around the stage, focusing on everything there and knowing where everything is. To practice this I would stand in a room and go through the procedure of expanding the circle, and being aware of what's in the room I'm in. I would practive this in the Art Centre as it is generally a large room and I would have to emphasise my movements and voice so all 3 sides of the stage could hear/see me. Stanislavski also calls for the use of the 'Emotion Memory'; "Just as your visual memory can reconstruct an inner image of some forgotten thing, place or person, your emotion memory can bring back feelings you have already experienced." You would think that this would give a more emotional performance and convince the audience that the character is 'real'. However, the use of your emotional memory with a character may end up with you not acting at all, but saying the words from the text as you bring up all your past emotions. ...read more. This can lead to an interesting performance as the two tempo/rhythms contradict each other and i believe this creates a stronger visual impact on the audience. The whole System was designed to allow characters to become more indepth and Stanislavski spent many years trying to studying and experimenting with his System. Studying it you can initially see where he was heading, the only problem being the length of time needed to complete the system, with a character. Unfortunatly, we havn't got the required length of time available to us, so it is of great difficulty to fully study and complete Stanislavski's techniques. However, Stanislavski's ideas for realism and naturalism were a great influence on this last century, and parts of the System are still used today in rehearsal time when creating a role. The Magic If has had a great impact on all aspiring actors as it has taught us how to develop our roles to create the most realism possible. Stanislavski's techniques are of great importance as they truly indicate to the actor how to portray their characters role by looking at their personality and studying how they move around stage as a person. 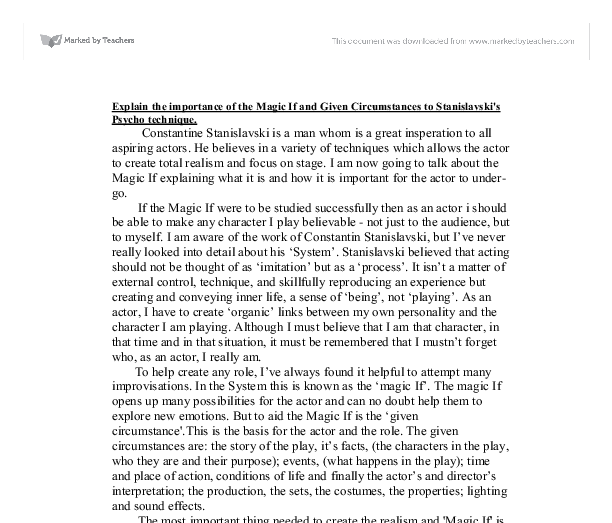 In conclusion, the 'Magic If' is very important for all actors as all mainstream actors follow the system and Stanislavski has become a big rolemodel to many because of it. By Scott Burnam-Richards ...read more. We decided that the best way to portray that Al was insane without actually saying it was to show scenes of what he thought was happening. We then threw in little hints that Al was really in a mental institution and what the audience was seeing was only what Al believed was going on in his head. Not all performances allow for this approach to attention, as some may require the need to monitor the audience and connect with them. This would be the case when a speech is delivered directly to the audience. Or in the case of a comedy, an actor needs to observe the audience reaction and alter the performance. The tension starts to build up when Donald is trapped inside and is screaming 'Open the door'. At the peak of the climax the audience will be on the edge of their seats wanting to help him. Actors were to do this by showing their social status and relationships with other people. We practised doing this in order to help us understand what was required of this technique. We explored an archetype of an old man by letting an imaginary piece of string pull our nose and bottom in opposite directions. (Garc�a M�rquez 12 - 13) One Hundred Years of Solitude is a fictional story that nevertheless recounts a real history. It relates through metaphor and symbolism the tale of Garc�a M�rquez' home country of Columbia. Of course, the reader cannot help wondering exactly how that Spanish galleon did get so far inland, after all.